In November 1939 Finland purchased thirty-five Fiat G.50s from Italy, these being serialed FA-1 to FA-35. Only fourteen of the thirty aircraft delivered by the end of the "Winter War" with the USSR were in condition to operate. All thirty-five had arrived and were in and out of serviceable operation by the time of the "Continuation War" against the USSR, when Germany began operation "Barbarossa". These aircraft were assigned to three flights of Lentolaivue 26 (Flying Squadron 26) and replaced the squadron's aging Fokker XXIs and Gloster Gladiators. LeLv 26 flew the G.50s until Brewster Buffalos replaced them in May 1944. All serviceable Fiats were turned over to Hävittäjälentolaivue 30 (Fighter Flying Squadron 30) and Täydennyslentolaivue 35 (Trainer Flying Squadron 35). LeLv 26 achieved 99 aerial victories with the Fiat G.50s for the loss of only 4 in combat. The model I have constructed represents the G.50bis flown by Warrant Officer "Oippa" Tuominen, who shot down 23 enemy aircraft while piloting Fiat G.50s (thirteen while flying FA-26). He was the top Fiat ace and ended the "Continuation War" with 44 overall air victories making him the fifth leading Finnish ace. He survived the war and became a top rally car racer during the late 1940s and early 1950s and died of natural causes on January 28, 1976 just short of his 68th birthday. As a note on Finnish G.50 camouflage I have painted my model to represent W/O Tuominen's G.50bis as it appeared in early August 1941, when the plane still retained its Italian scheme. He had thirteen and one-half victories at this time. The white victory markings denote bombers, the black markings with white borders denote fighters, and the blue markings with white borders denote flying boats. In June 1941 just before "Barbarossa" the Finns were given notice by Germany to paint the undersurface of the wingtips yellow, together with a yellow fuselage band twenty inches in width. 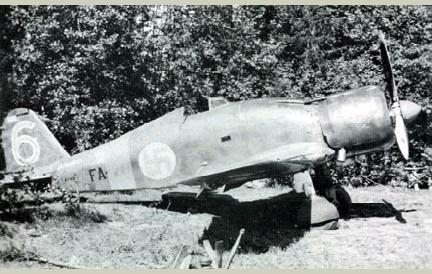 At the end of August 1941 all Finnish single-engine fighters had their cowling fronts also painted yellow. 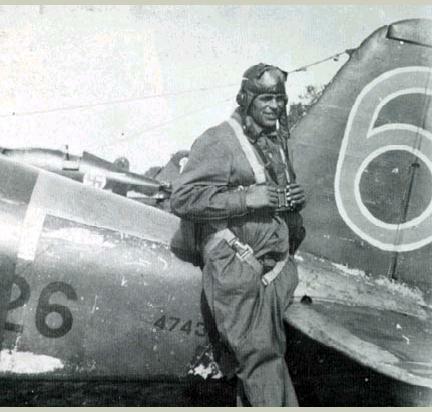 In June 1942 the Finnish Air Force began painting their aircraft in an olive green and black uppersurface camouflage with light blue undersurfaces. The cowling, fuselage band, and under wing tips still retained their yellow recognition markings. This camouflage was used for the remainder of the "Continuation War" with the uppersurface black receiving a white distemper covering during the winter months. The title "Rohkea Suomi" means "Courageous Finland". The interior of this kit was rather spartan for a kit of this scale. Using a cutaway drawing of a Fiat G.50 from THE COMPLETE BOOK OF FIGHTERS, I began scratch-building the armor plating, seat height control rods, sidewalls, throttle control, and radio boxes from styrene strip, rod, and sheet. The interior was painted RLM 02 Green-Gray, which is close but not an exact match for the Italian interior color (the actual color is a shade or too lighter, but I could find no federal standard number to match and no paint was available for this color). Thanks to the IPMS buddies who informed me that RLM 02 was acceptable. I didn't bother lightening the Gunze paint I used, because I wanted to be able to touch-up where necessary and have the paint match. The instrument gauges were done by my now tried and true method of using Waldron-punched disks of white decal film and Reheat Models 1/48 scale gauge decals over the white disks. The throttle control and radio box were painted flat black. The floorboard, seat, and two side doors were given light dry brushing of flat aluminum. Seat belts and shoulder harnesses were from True details photoetched German set. The belts were painted dirty white with the buckles and harnesses painted flat aluminum. The gunsight was scratch-built from white and clear styrene sheet. I cut out both doors from part B45 and added opening levers and rods from fine wire. The levers were given a drop of Kristal Kleer to represent the lever knobs and these were painted flat white as per reference photos. I also carefully etched in the arced slots for the levers with an X-acto #11 blade and scribing tool. The engine in this kit was as plain-jane as one could be for this scale. I had first thought of ordering an Engine & Things resin Fiat A-74, but concluded that the alterations necessary to install such would require more work then I wanted to do. I decided to work with the kit piece and added plug wires from small gauge solder and a fuel line from small gauge wire. The engine was painted Polly-S Oxidized Aluminum with the gear box painted Gunze Steel, the push rods painted bright silver. And the control boxes painted flat black. After giving the engine a coat of Min-Wax Polycrylic to protect the fragile Polly-S Metalline paint I applied an ink wash to the engine using India ink diluted with water (do not dilute India ink with acrylic thinner or alcohol as it will dissolve the clear coat and the other acrylic paints). Although Hasegawa marketed this kit, Secter Corporation originally molded it. The kit featured finely recessed panel lines, but was lacking in detail for the exhausts, machine guns, and pitot tubes. It also lacked the venturi tube seen on all Fiat G.50s on the starboard fuselage. I scratch-built the two exhausts from styrene tubing that was drilled out and thinned for each exhaust. I also added an exhaust collector ring to the back of the cowling interior from 1/8-inch solder. These items were painted Gunze Burnt Iron with the external exhausts receiving a dusting of SNJ powder. The machine guns were done from left over stock of perforated barrels I ordered several years ago from Meteor Productions. I inserted two sections of 23-gauge hypo tubing for the actual barrels and the perforated pieces for the cooling jackets. The blast tubes were cut from 18-gauge hypo tubing. The guns were painted Tamiya Gun Metal, whereas the blast tubes were simply given a coat of clear flat. The pitot tubes were done with insulin hypo tubing inserted into 23-gauge hypo tubing. I worked up the venturi from styrene tubing and wire. I also sanded away the oversized protrusions on each wing for the navigation lights and replaced these with styrene rod after sanding the seam on the two wing halves. The landing gear bay was very shallow, but I left it alone and simply used a tech pen with black India ink to shadow it and give it the illusion of more depth. I added retraction jacks for each gear from stainless steel wire and 23 gauge hypo tubing. I also added brake lines from 34-gauge aluminum craft thread. The secondary gear strut cover doors (parts B26 and B27) were not seen in reference photos of Finnish G.50s and were left off. The carburetor air intake on Tuominen's FA-26 was much smaller than the original intake on G.50s. I cut the kit piece using dimensions arrived at by converting a 1/72 color plate of Tuominen's aircraft. I added small milkscreen wire mesh to the carburetor intake and also added two Waldron-punched disks of milkscreen to the oil cooler intakes in each wing. Antenna attachment posts were made from 34 gauge aluminum craft thread wrapped around a sewing needle until I achieved the size hole I wanted. These were attached before painting, but the smoke-colored invisible thread wiring was added in the final assembly. Also added in the final assembly were the navigation lights for each wing and the end of the tail. The lenses were simulated with Kristal Kleer with the port wing light painted clear red and the starboard clear green. In reference photos I noted a small indentation at the front of each horizontal stabilizer where the spar attaches. I slightly cut this indentation in each fuselage half and filed it with a round micro needle file. The pilot figure came from Rick Troutman of the Roanoke Valley IPMS and I believe originally came from an old Monogram kit. I reworked the figure to resemble a picture of Tuominen in FINNISH FIGHTER ACES. The figure was primed in neutral gray and hand painted using acrylic paints. As a helpful hint when painting with quick drying acrylics, use glycerin to retard the drying time. It is available at your local art supply or pharmacy and does not disturb the flow of the paint; it just keeps it from drying out on the brush. After all initial painting the figure was coated with Min-Wax Polycrylic and given a wash of dark brown, dark gray, and black where appropriate. Once the wash had dried, I buffed the figure with a dry cotton swab and gave it an overcoat of clear flat. This too was rubbed out a day later and the goggles painted bright silver and followed with Tamiya Smoke. After masking the interior and engine compartment I primed the entire model with Polly Scale Italian Blue-Gray, which was the correct color for the undersurfaces. After letting the primer dry for two days I masked the undersurfaces and painted the uppers Polly Scale U.S. Khaki, which matches FS30219, the color called for Italian Chestnut Brown in the IPMS Color Cross-Reference Guide. After this had dried for a day I sprayed a tightly mottled pattern of Gunze RLM 71 Dark Green. No set pattern could be seen in reference photos, so I used the color plate for Tuominen's Fiat as a rough guide. In most reference photos I could obtain, it appeared that the overspray seen on the model was present. Most photos show more wear and tear on the actual aircraft than I have presented. Once the dark green had dried, I gave the entire model a coat of Min-Wax Polycrylic Gloss to prepare it for decals. Decals came from AeroMaster Decals sheet number 48-144C. They were applied using the old microscale method. As a note I should inform you that I was informed by the AeroMaster people at the IPMS Nationals not to use Solvaset with their decals, as the stuff is alcohol based and will dissolve the inks used in the decals. I had learned by trial and error not to use this solvent with acrylic paints, especially Gunze, as it will soften them. I used Micro Set and Micro Sol. The decals still had to be cut in the control surface recesses once dried, with another application of Micro Sol to nestle them down where cut. Once the decals had dried, I washed the model in a mild dish washing solution and gave it another coat of Min-Wax Polycrylic Gloss. I then proceeded with an ink wash in the control surface recesses, as well as the cowling flaps, cooling slots, and access covers. Exhaust stains and cordite gun stains were done with powdered black pastels. I should mention that the First Aid hatch just behind the cockpit was generally seen only on Finnish Fiats. I drew this on clear decal stock with a .005 tech pen and added the First Aid cross from some left over SuperScale Me-109 stock decal. Lastly, but before adding antenna wiring and nav lights, I gave the model a coat of Polly Scale Clear Flat. Unlike Polly-S Clear Flat this paint dries super thin and does not need rubbing out after it dries.